Home > Scientific Services Staff > Simon Yunes, Ph. D.
Dr. Yunes received his B.S. degree in Chemistry from the Central University of Venezuela. He received both his M.S. and Ph.D. degrees in Physical Chemistry from Catholic University of Louvain, Louvain-La-Neuve, Belgium, with “La Plus Grande Distinction,” the highest honor to be granted by the University. His Ph.D. thesis was carried out under the supervision of Prof. Bernard Delmon, worldwide authority in the field of catalysis. 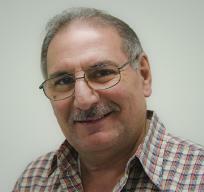 Dr. Yunes is recognized worldwide for his contribution to the field of adsorption and the application of adsorption techniques to the characterization of solids, particularly catalysts. During his studies in Belgium, Dr. Yunes was able to synthesize hydrotreating (HDT) catalysts from natural laterite and bauxite (naturally abundant in Venezuela) to efficiently remove impurities from Venezuelan heavy crude oil and lengthen the life of the classical catalysts used in such a process. His knowledge and interest in adsorption began at that time. All the synthesized catalysts were characterized using adsorption techniques for both physical adsorption, to study structure, and chemisorption, to determine the active metal dispersion of the catalysts. Dr. Yunes joined Micromeritics in May 1984, where he held the position of Senior Application Scientist, conducting experiments on adsorption, assisting the development of new products and writing application notes. His primary function at Micromeritics was to support customers worldwide with their applications, and to find or assist in developing new technologies to meet the needs of customers. From 1992 to 1996 Dr. Yunes managed a Micromeritics laboratory at the Venezuelan Research Institute (IVIC) in Caracas, Venezuela. This position was dedicated to assisting under-graduate and post-graduate students in characterizing their catalysts and to support their research for attaining their degrees. From 2004 to 2009 Dr. Yunes supervised the Catalyst Characterization Laboratory at the Venezuelan Petroleum Institute INTEVEP, serving all national refineries belonging to PDVSA, the Venezuelan National Oil Company. In September 2009, Dr. Yunes returned to the Micromeritics headquarters in Norcross, Ga, where his primary responsibility is the support of customers worldwide in their application of Micromeritics technologies. Dr. Yunes has given more than 150 presentations and seminars around the world in many languages. He speaks six languages, and he is a co-author of the Micromeritics book Analytical Methods in Fine Particle Technology. o The Venezuelan Institute of Scientific Research "IVIC" as a research student. Three years of research conducted with Dr. J. Laine,1975-1978. o The National Hydrocarbon Funds of Venezuela "FONINVES" for postgraduate studies conducted in Belgium.